Before staining a wood deck it must first be cleaned properly to ensure lasting results. 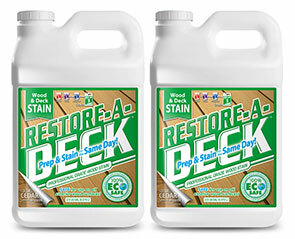 Wood and deck cleaners are designed to clean wood and prepare the surface prior to stain application. The purpose of a deck cleaner is to remove contaminants such as dirt, grime, graying, mold, mildew, and algae. In some instances, a very faded old stain can be removed as well using a wood cleaner. There are many different types of exterior wood cleaners to choose from. Typically, deck cleaners aid in the scrubbing or power washing of the wood during the cleaning process. 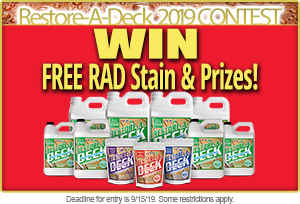 Most deck cleaners consist of caustic soaps that raise the pH level of the wood leaving it in need of a deck brightening application that will neutralize the cleaner by lowering the pH level and brightening the wood. Some of the best deck cleaners on the market today are the oxygenated deck cleaners. They consist of an active ingredient known as Sodium Percarbonate. This is an EPA registered ingredient for removing mold and mildew. Sodium Percarbonate blended with other power boosting detergents make up one of the best deck cleaners available for cleaning exterior wood prior to staining. 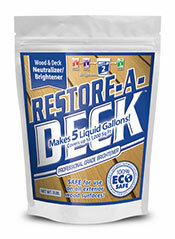 Restore-A-Deck comes in the form of a concentrated powder that mixes with water for effectively cleaning exterior wood. It can be applied with a pump up sprayer or scrub brush then rinsed off or power washed. The concentrated powder formula also results in a smaller, less expensive container. 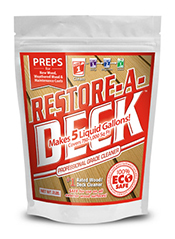 Restore-A-Deck oxygenated deck cleaners are professionally tested and used by most deck cleaning contractors. Many professionals report excellent cleaning results over the older bleach based deck cleaners. 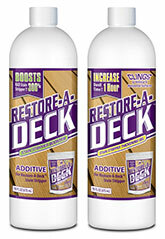 Bleach cleaners have been proven to actually damage the wood fibers and jeopardize a deck's structural durability. After much investigating, the research reveals it is hard to beat the power, convenience, price, and overall effectiveness of the oxygenated deck cleaners. Restore-A-Deck deck cleaners make the prep process easier overall and give you professional like results. Can I use RAD on Teak outdoor furniture? 2)Clean all portions of decking and apply a TWP or wood Rich CLEAR-Transparent stain to this decking. What do you recommend? I have researched TWP and they are a good product, (1500), BUT i recently called there number off their website and it is disconnected. Are they out of business? You would want to clean and prep all. You cannot spot clean. TWP is a great stain and would work well. Clear with not tint though means it will not provide UV protection from graying. We tested the TWP phone number and it works fine. What number did you dial? Maybe dialed wrong? I have a deck that has semi clear Cabots Austrian Timber oil on parts of it that are somewhat protected by an overhang. It was last stained about 5 years ago. Can I clean and remove the remaining stain with the cleaner or do I need a stripper. You will need the stripper followed by the wood brightener to remove the Cabot. Help! I am finalizing the prep on 6 mos old rough sawn cedar and have run out of Step 2, leaving a small area only prepped with Step 1. I will order more of the two Steps, but because of work/weather, I really need to get the stain done tomorrow. Can I use anything else to as an alternative to Step 2? there are no dealers within 250 miles and the holiday precludes use of mail/shipping in a timely manner. How will the lack of Step 2 affect the performance of using redwood Woodrich timber oil? Will the obvious color difference show up after the stain is applied? The wood will be slightly darker in the area where the brightener was not applied. No difference in performance of the oil. The directions say to dry in 75* temp for 3 days.It is October here in Wisconsin and the temperature may be in the 60's. Can I still use the RAD kit? This is a new cedar deck that has been weathered for about 4-5 months. We would like to finish with Woodrich timber oil before it snows. Thank you! Yes you can still use it down to about 50 degrees. 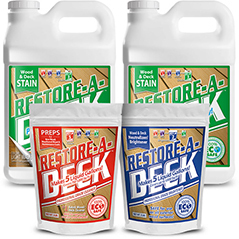 You would want the Restore A Deck Stain Stripper and the RAD Wood Brightener for the prep. Stain with AC. Great, thanks for fast response! Is this safe to use on a dock over a 1-acre fishing pond. thanks. Ania, do you know what the black is? It could be rust if around nail heads. Ann, use a stripper and follow with a brightener. yes you can go longer. A couple of weeks will be okay. The directions say to wait 3 days after cleaning before staining. Can you go longer as long as you wait the 3 days for the deck to dry? I read somewhere that stain should be applied while the wood pores are open...don't know if there's a window of opportunity for that. Thanks in advance. Yes you can apply to a fence as well. If you prewet the landscaping and rinse well than it will not harm anything. Do I need to apply RAD Cleaner with a pump up sprayer or is there another way to apply it? Also, how much time can one leave between the cleaning and brightening steps? You do not need to stain if you do not want to but the wood will gray from UV. I am new to deck cleaning/staining. 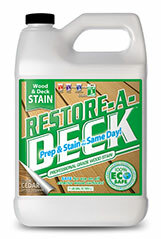 Can you use this deck cleaner to just clean the wood and not stain/seal if the wood is not chipped or faded? It is not sold in Canada. 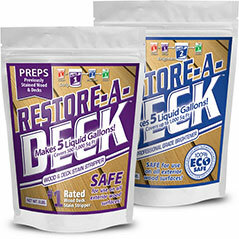 Can anyone tell me where I my be able to buy Restore-A-Deck kit in Alberta Canada.